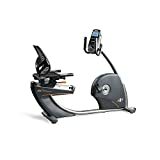 Sporting a full range of features delivers onboard entertainment and advanced training tools, while the seat of the NordicTrack Elite R110 recumbent bike offers comfort and stability as you work out. The oversized cushioned seat features a ventilated back and easy adjustment lever. Get a new workout delivered every day to the Web-enabled touchscreen display and follow your stats as you work out. A self-adjusting fan keeps up with your speed to keep you cool as you train. STABLE WORKOUT ADJUSTMENTS Keep your focus as you change your intensity. Integrated handle controls let you select your workout and alter your resistance without taking your hands off the handgrips. Simple controls change your workout without compromising your stability. SEATED WITH SUPPORT Exercise in comfort with the chair-like design of our recumbent cycles. The oversized, cushioned seat is built with lumbar support and is also ventilated so you can stay cool, relaxed and focused during your workout. IFIT COMPATIBLE A revolutionary interactive training program, iFit technology helps you get much more out of each workout. Track your progress, replicate real-life runs with Google MapsTM, train with Jillian Michaels, and custom-tailor your workouts to your specific goals. SET GOALS, STAY IN THE ZONE Get a quick, accurate heart rate reading with dual Cardio-Grip sensors built into both handlebars. A Bluetooth Smart wireless chest strap is also included and allows you to send a continuous reading to the display so you stay in the right training zone to help you reach your goals.